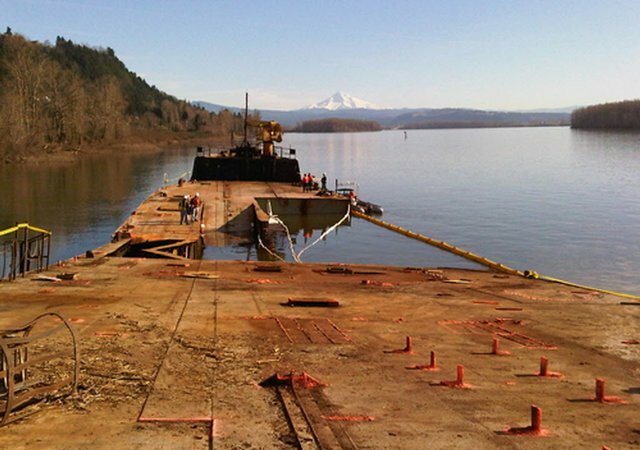 VANCOUVER, Wash. -- The Coast Guard says workers are trying to stabilize a derelict vessel leaking oil in the Columbia River near Camas in southwest Washington, so divers can remove all remaining oil. More than 50 responders from agencies that include the Washington Department of Ecology and the Oregon Department of Environmental Quality are on the scene. The Columbian reports about 1,200 gallons of oil have been recovered since work began last week. Washington Ecology officials have measured a small amount of PCB, about three parts per million, in oil from the engine room but say it is not an immediate health threat. The 431-foot Davy Crockett is a World War II Liberty ship that was converted to a barge.